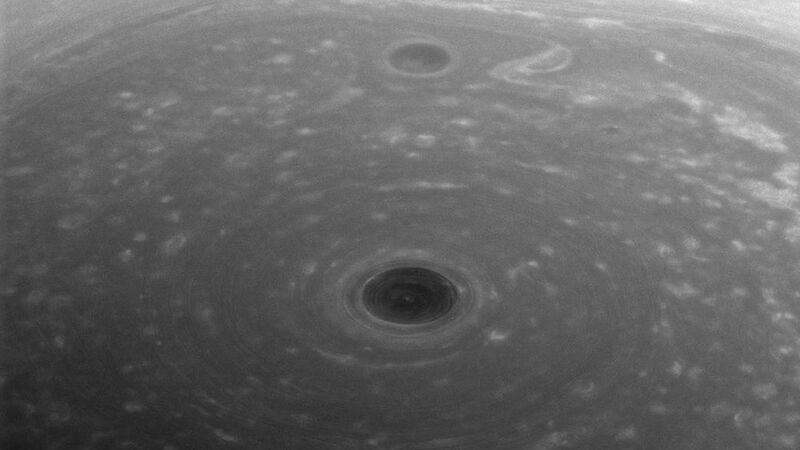 Saturn's north pole photographed by Cassini earlier this year and released yesterday. Before it ends its mission to Saturn by intentionally hurling itself into the planet's atmosphere on Sept. 15, the Cassini spacecraft will complete a series of measurements announced today by NASA. Sept. 11: Flyby of Saturn's moon Titan that will put the spacecraft into its final plunge. Sept. 13 and 14: Final photos taken (including of Earth and the very last will be of the propellers) and transmitted to Earth. Sept. 14 and 15: Eight onboard instruments will be sampling the upper atmosphere of Saturn during the final plunge. Early morning Sept. 15: Loss of signal about 950 miles above Saturn's cloud tops. Seconds later it will melt from temperatures of 200 - 500°C. Hydrogen plumes on Enceladus, which could conceivably support life. "Enceladus has no business existing and yet there it is screaming...'I completely invalidate all of your assumptions about the solar system,'" Cassini program scientist Curt Niebur said in today's press conference. Images of Titan, which Cassini confirmed has methane seas and rivers on its surface.